Starting a Facebook page for a brand should be an essential part of your social marketing strategy and if you haven’t done so already, I would definitely suggest doing so. Though, I understand in the beginning it seems extremely difficult, especially if you’re on a budget and don’t have the luxury to spend money on advertising. Don’t worry, I got you covered! Here are some ways that have worked for me (on other sites) on how to get more likes on Facebook Pages for free. 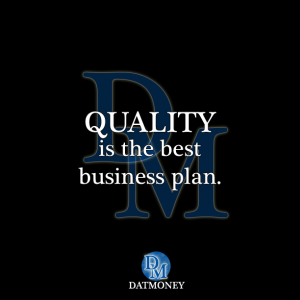 Before I continue, let me just add a shameless plug for you guys to like DatMoney’s Facebook page, where you’ll find helpful tips that includes anything from daily work routines for entrepreneurs to full business strategies, informative infographics, motivational quotes, and much more! 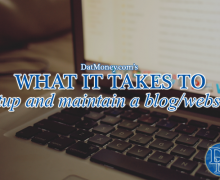 I haven’t had the chance to use these marketing strategies I’m going to go over for DatMoney yet (I’ve used one but I’ve been so busy that I haven’t even updated with new posts on here till now!) 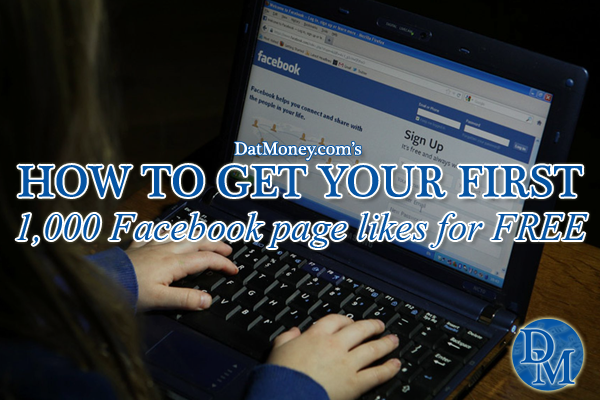 but these tips should help you get your first 1,000 likes on your page within the first month, if you put in the work. I think it goes without saying that you should have a profile picture and cover photo that represents your brand and what your page is going to be about, but it’s the small details you shouldn’t overlook. The more information you have filled out, the better. Not only will it help you in Facebook search engines but also Google as well. And yes, if you’re struggling to rank your site in Google, at least your Facebook page will definitely show up to direct your visitors to you. People on Facebook want content and the more they have regularly, the better. Though, make sure it’s within your niche or you lose some credibility. For instance, if you’re a Youtuber, you’ll want to engage your followers with videos they won’t see on their Youtube channels, pictures of their daily lives, etc. If you’re a food blogger, you’ll want to share recipes, food pictures, cool cooking gadgets, etc. If you’re a developer, helpful tips for other developers, updates on what you’re developing, etc. The more awesome content you post, the more people will like and share with their Facebook friends. If their friends like your content, they’ll potentially like your page and then it’ll be a domino effect of sharing with their friends and their friends’ friends. 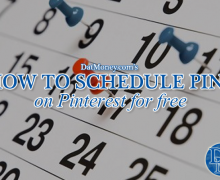 I know posting a lot of content regularly seems like a daunting task, but luckily, Facebook has a scheduling tool so you can technically schedule your posts months in advance, if you want. Personally, I usually post 3-5 times daily for the pages I run and schedule it for the next week or so. You’re not actually stealing away from your competition, but you’re enticing their followers to like your page as well. Here’s what I do (with stats on a page I just started a couple weeks ago). Do A Facebook Search For Keywords In Your Niche – Look for popular pages in your niche that post pretty regularly. I usually go with pages that have over 100,000 likes and posts at least a handful of times daily. Add Thoughtful Comments (Or Pictures) That People Will Like – If you add a comment that lots of people will like, then your comment will be more visible to anyone looking at the comments section. Depending on your profile picture and Facebook page name (that’s why it’s essential to optimize your page), it will entice people to click through to your page with potential of liking it. Now if you’re able to upload a picture (some pages don’t allow adding images in comments sections) that you know will get a lot of likes, that will be even better. For instance, if you run a food Facebook page, you should comment on other food related pages. Your brand name itself should entice people to check you out, if not, then your profile picture. If the page allows you to upload an image, try uploading a picture of your food related picture and I’m sure that will make people want to check your page out. Like All The Comments You Agree With – Give a thumbs up to all the comments you agree with in the comments section. The more, the better. The key is to get the attention of the person commenting because they will get a notification that you liked their comment. If they’re as curious as I am, they’ll probably check you out. I find that the comments that already have tons of likes probably won’t check out your page because they already received a bunch of notifications; which means your thumbs up will just get lost in the shuffle. If you focus on the ones that don’t have any likes, those convert a lot better. Please, please do NOT go on a liking spree for every single comment. Eventually people will notice and there goes your reputation. Finding More Pages To Comment On – Now at this point, you should have a bunch of new likes with the few pages you implemented this tactic on. But maybe you’re overdoing it with those few pages so you need to find even more related pages. Use your current followers for that! Take a look at your followers profile and if it’s public, check out the other pages they’ve liked that are somewhat similar to your niche. Use this same tactic on those pages as well. Stats Implementing This Tactic – If you’re looking to get your first 1,000 likes with just this strategy, you’ll need to average about 34 new likes each day. Now, the more followers you get and the more they share your content, the easier the likes roll in; but let’s just cut that part out of the equation so you don’t rely on it. Here is an example of a new Facebook page I started a few weeks ago. Though, I’d like to mention that I didn’t implement this strategy every single day and usually when I did, it was when I was laying in bed, waiting (like for friends or food at a restaurant) or sitting on my throne. Sorry, too much information but it’s the truth! 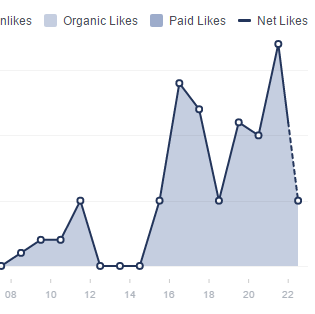 As you can see in the chart, it started slow in the beginning, spiked higher (the most likes in one day on this new page was slightly over 50) the more I implemented this tactic and didn’t receive likes on days I simply didn’t have time to do it. This was the only tactic I implemented during the beginning because I wanted to write up this post on this specifically. The more work you invest, the more likes you’ll get. Unfortunately, I run multiple sites, multiple social media profiles (for each) so I don’t have the luxury to spend as much time. 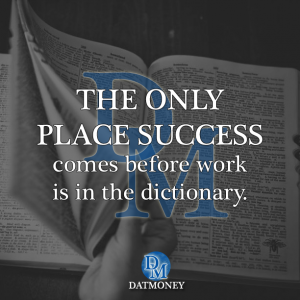 And I’m sure a lot of you guys don’t have tons of time to invest either but to get results, you have to put in the time… or spend money (on advertising or having someone do the work for you). On each one of your social media profiles for your brand, you should have different types of content or some sort of incentives for them to like each one. With that said, cross promote on all your social media pages and don’t forget to add a link on your emails, business cards, digital marketing materials, etc. Basically, anywhere you can promote, you should. Do you have a lot of personal Facebook friends? Or do you have people that like your posts but for some reason they didn’t like your page? 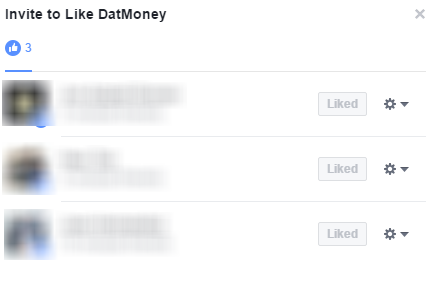 Well, you can send out an invite for them to like your page (this is literally the only tactic I have used on DatMoney’s Facebook page). To invite your friends from your personal page, go to your business page and on the left hand side there should be an “invite friends to like this Page” link, as shown below. To invite people that have liked your posts, simply go to the post in which they’ve gave a thumbs up to, click on the “likes” to show who has liked it and next to each person’s name will have “invite” button, as show below. For those that already like your page, it should have a grayed out “liked” button next to their name. If they’re interested or they’re supportive, they’ll be glad to give your page a thumbs up. At the end of the day, every page will be different when it comes to getting likes. The more generic your audience, the more likes you’ll potentially get. The more specific the niche, the harder it may seem. Just remember, it’s not about the quantity of the likes, it’s about the quality.